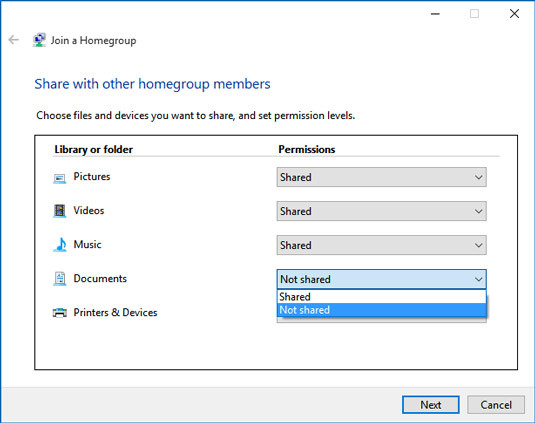 When you set up a network on your Windows 10 laptop, you have to arrange to include each computer on the network in a Homegroup so that they can connect to each other, a single Internet connection, and shared hardware such as printers. If somebody has set up a Homegroup on another computer, you can join that network with a few steps. With the Wi-Fi category selected on the left scroll down the right panel and click Homegroup, click the Join Now button, and then click Next. Click the various drop-down lists to choose what to share with the Homegroup on the network. Click Next and enter a Homegroup password. Click Next again to make your laptop part of that Homegroup. To locate the password for the Homegroup, you need to sign in as a user with administrator status. Then, open the Start menu and choose Settings → Network and Internet → Homegroup. Click View or Print the Homegroup Password.